At the third stop of fashion weeks this year the Milan fashion week was overpowering with replica heads & baby dragons. The critics are declaring a new glorious dawn of the fashion, thanks to fashion houses Gucci, Versace, Giorgio Armani, and Moschino, who are considered to be the yearly trend tie-breakers along with some less internationally famous ones. With special thanks to Missoni’s creative line up in this year fall collection, MFW proceeded by keeping its knack of geometry. Being utilized either in the form of subtle touches, or as abundant leitmotifs, geometric patterns were literally all over the place on Milan runway. Tartan and checked patterns played a major role in this category, as they were omnipresent and just ultimately shaped this absolute fall 2018 trend. Setting the tone with plaids to cowboy boots, the runway was influenced by 80’s evidently with the hint of some statement sequins. The Forties were the ones that were revisited the most, mainly thanks to Fendi, but also the Sixties with Moschino’s gorgeous aliens-meet-Jackie-Kennedy ensembles. The 70s, and the 90s ruled the shows, with the former being predominantly translated to soft, earthy tones, and bell-bottom lines, and the latter being the trendiest epitome of Milan’s glamorous era. The world’s kings of maximalism, Massimo Giorgetti and Alessandro Michele, surely had a huge influence. The 80s were so diverse in terms of style that there’s a suitable trend for everyone when the runway is inspired by it. The choices of leopard prints that MFW housed are unlimited. Animal prints were huge this season and unlike the three installments of fashion weeks before MFW, this one seemed to have a special affair with the leopard print. Versace leads the pack here with power trench coats to mismatched sweat suits. Donatella reimagined all of the era’s cult classics for fall 2018.Mustard yellow, tan, tangerine and all versions of brown hues — the 70’s classic tones were another big story in Italy. Maxi skirts and dresses, worn under polished straight-cut coats or capes, were presented at many MFW runway shows, leaving the audience both mesmerized and puzzled. 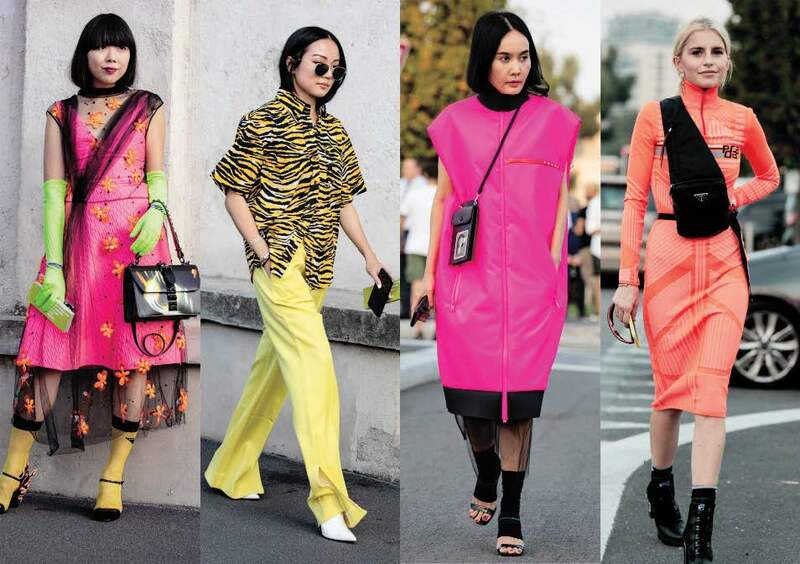 While NYFW had magenta-colored, and LFW had more hot pink-flavored, the Flashes of ultra-bright, fluorescent color lit up Milan Fashion Week. MFW’s trending colour palette was all about neon hues, whether blue, green, or pink. Bold, fierce and mostly in solid patterns giving one of the most unabashed fall 2018 fashion trends that we could ever hope for. Adding to its glorious reputation, fur was an unapologetically fashionable part of many runway shows, appearing both in the form of little details or as actual coats, often appearing synonymous with luxe and timeless styles. This year the runway kept it clean and eco friendly with most of it being faux fur, even Giorgio Armani has decided to give up on real ones. Fendi’s fuzzy sweatshirts are sure to be the biggest draw for street style fanatics: The genius design is already being snapped on Kaia Gerber and the Hadids. The right way to invest for your Fall wardrobe though is to go for belts. Belts were worn over every outfit giving a high five to the overpowering 80s theme in general. Belts were used as standout accessorizing options at almost any runway show, from Versace to Marni to Dolce & Gabbana. The coats and jackets were quite a common statement and adding the new punch was the Slick finish of the surface on bright red, yellow, blue hues. With all the overpowering and era defining trends offered by Milan Fashion Week, it is going to be quite a struggle to choose the right tone for the retail brands in terms of following and incorporating the trends in their collection.